This thread is dedicated to those remarkable flying mammals, the bats! 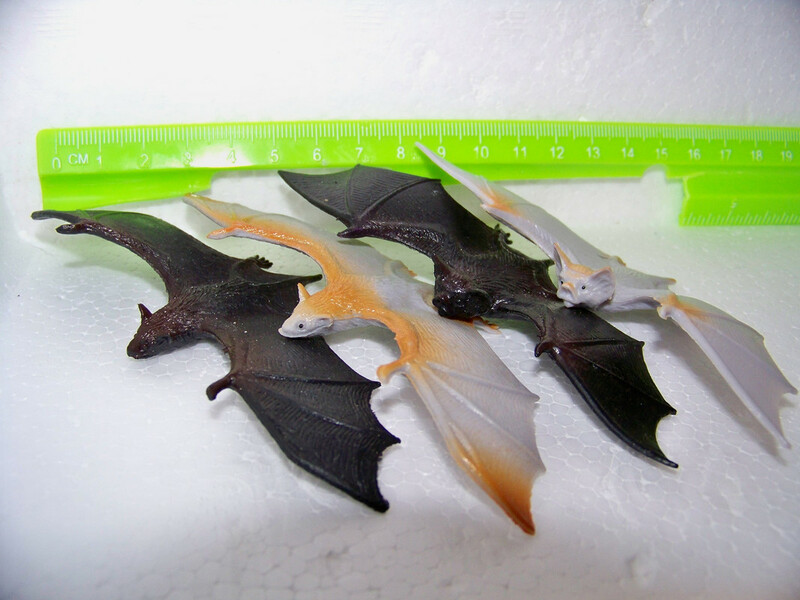 So whether it's a Little Brown Bat or a giant Flying Fox, post 'em here! These six bats look like they could have been made by PV, but they're not. I'd love some help IDing the species! 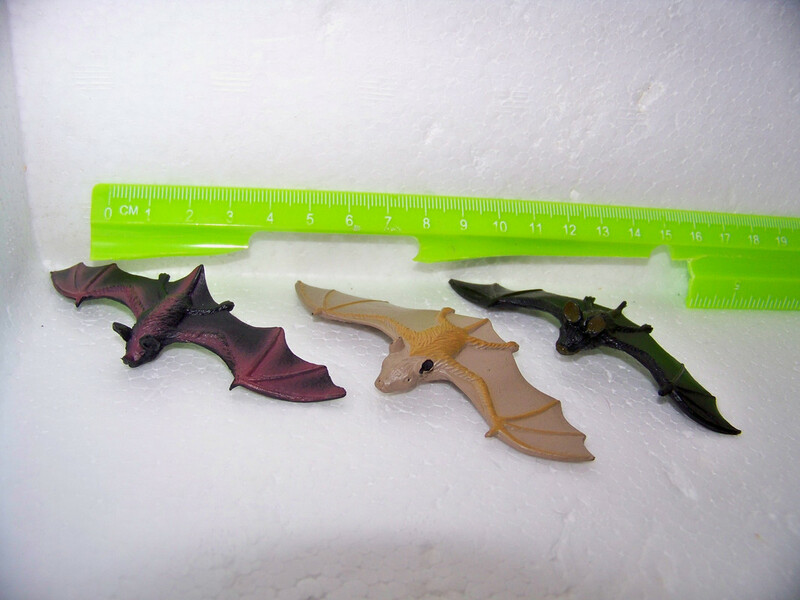 I bought a whole bunch of these bats at a Halloween store because they looked surprisingly good. They look a bit like a flying fox and a vampire bat. 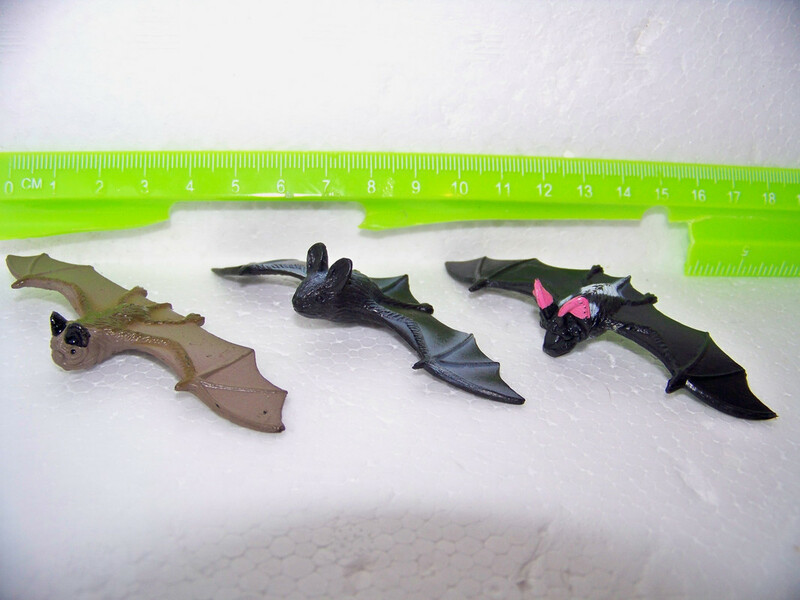 I also saw at that store a bat that looked like it was cast from a real specimen (looked like a "brown bat" sp); it was attached to a necklace. I regret not purchasing it. Oh, I'd overlooked this thread. Good choice of animals! I must confess, I've somewhat overlooked it, too. Identifying bats is really hard, though (at least to species level). The brown one on the left in the first photo is apparently a rhinolophid. Some of the others may be identifiable further, too. And they really look like PV. Wasn't there a PV bat set, too? 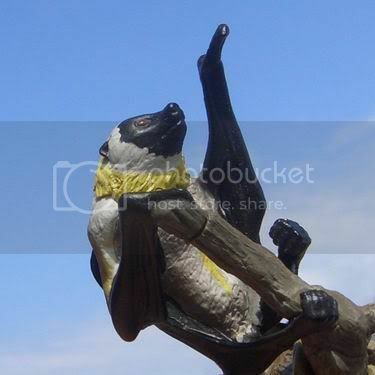 Pteropus dasymallus Temminck, 1825; Ryukyu Flying Fox. 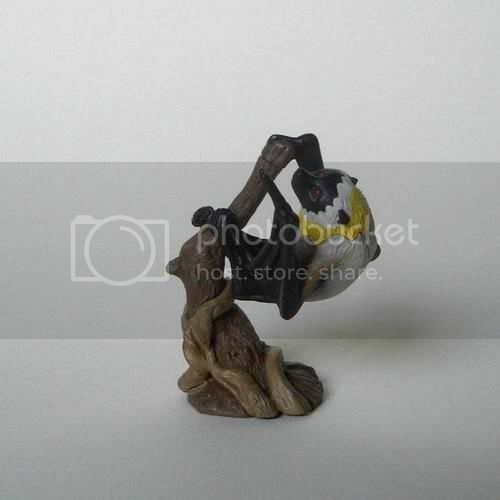 Furuta Choco Egg Animals of Japan Series 5. Not sure about the scale since I forgot to measure the figure but I believe it should be something between 1:10 - 1:15. Sooo jealous of that Kaiyodo National Monuments Flying Fox (the one in the tree--I think thats from the "monuments" series, but maybe I'm wrong). Wonderful picture! Sooo jealous of that Kaiyodo National Monuments Flying Fox (the one in the tree--I think thats from the "monuments" series, but maybe I'm wrong). It is indeed! But the series' correct title is 'Natural Monuments of Japan'. Here is my complete set . There aren't a lot of bats out there that I'm aware of (figure-wise, I mean). I'm new to the hobby so I'm not as aware of a lot of the Japanese brands and such, but I do really wish the Big Companies paid more attention to bat releases. As it is, I'm only aware of the Incredible Creatures brown bat from Safari (they have a new release for 2013, can't remember which right now), but I'm not over-fond of the way they look. 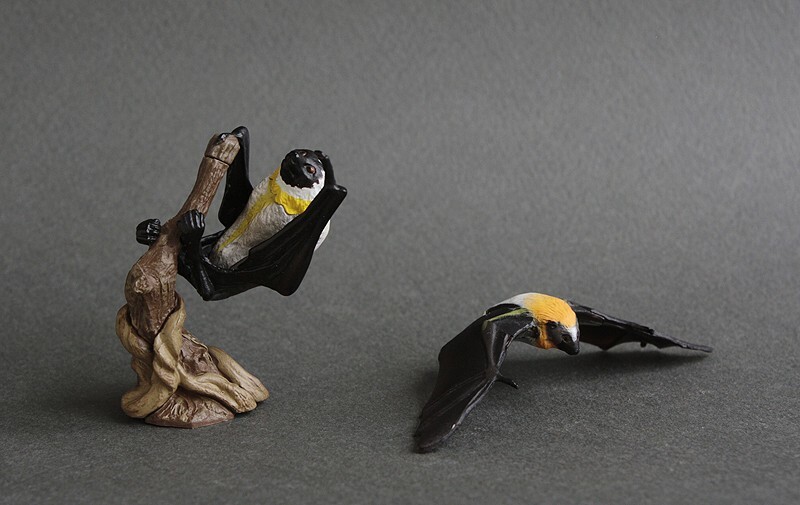 I would like that other brands as Schleich will do species of bats .